Breast augmentation surgery increases the volume of the breast for women with naturally small breasts, as well as replacing depleted volume following breastfeeding or weight loss. It can also be used to change the breast shape for women who have developmental and chest wall deformities, such as tubular breasts or asymmetry. We often get asked about the difference between saline and silicone implants, and their risks and benefits. 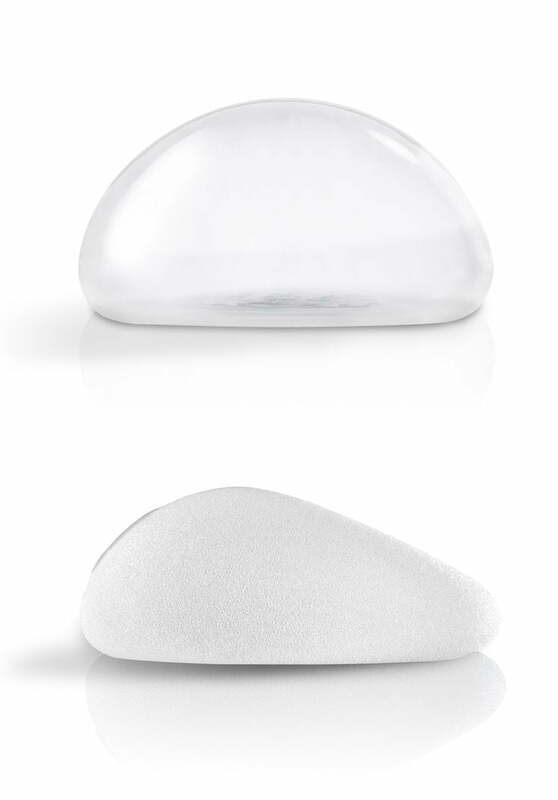 The ‘shell’ of a breast implant is made from an inert polymer called silicone; this can be either smooth or textured. Smooth walled implants move around subtly in the breast pocket, which means they can mimic the movement of a natural breast - and textured implants encourage soft tissue ingrowth into their small surface interstices, keeping the implant more stiffly in place. Breast implants have a variety of base widths, projection amounts and volumes (measure in ‘cc’). There’s no one size fits all approach to breast augmentation; the best implant for each breast is thoughtfully selected and matched to the corresponding space to achieve the specific goals for each patient; indeed, sometimes two different implants will be selected for one patient, as each breast can be different. What are breast implants filled with? Silicone gel is an inert polymer with no known human allergies, sensitivities or reactions. Likened to the consistency of turkish delight or gummy bear sweets, the molecules are stuck to one another in a cohesive matrix. In comparison to saline, it flows differently within its shell and can often create a more natural look and feel to the breast, like breast tissue, while retaining more form and shape. These are by far the most-commonly used type of breast implants in Australia. Saline is sterile water. These prosthesis consist of a silicone shell containing saline water. Underneath thin skin, folds of a saline implant might be seen or felt more easily, causing a rippling or wrinkling appearance. These implants are less commonly used in modern plastic surgery. How have breast implants improved or changed over the years? Silicone gel implants were first created in the late 1960s and have undergone several different evolutions, with modern generation implants featuring technological improvements. Saline implants are an alternative to silicone, becoming popular in the 1990’s, and decreasing in popularity since the early 2000’s. Over the last 20 years, significant advances have been made in silicone gel implants; both in safety and function, but also in their physical characteristics, options and the aesthetic result they produce. Contemporary silicone implants have a slightly higher fill (96% fill versus the previous generation’s 85% fill) and more cross linking of the silicone molecules, increasing the cohesiveness of the silicone. What variants of silicone implants are available? Different degrees of cohesiveness (cross linking of the silicone molecules) are now available in silicone gel breast implants. The least cohesive implants are softest and flow most easily, and are most commonly used for routine breast augmentation using round implants. Higher cohesive silicone implants tend to hold their shape most firmly, with potential advantages for post-mastectomy breast reconstruction. For anatomical implants, a higher cohesive gel is used in order for them to hold their shape, and achieve the specific projection or balance of fullness that the patient requires to achieve their desired result. How do we know breast implants are safe? Silicone gel breast implants are the most widely studied medical device in the history of medical devices; primarily because so many women have them (last year 1.5 million implants were implanted worldwide). Historically, silicone gel implants received negative publicity in the 1980s and 1990s, with apparent claims of adverse associated health problems, prompting removal and replacement of older silicone implants with saline filled devices. But since that time, silicone implants have changed dramatically - and extensive clinical research with long term follow up has confirmed no association between silicone gel implants and breast cancer or chronic autoimmune disease. In more recent times, breast implants have been linked to anaplastic large cell lymphoma (ALCL); a very rare cancer of the implant capsule (not cancer that originates in breast tissue) and that can be effectively treated, when detected early. Recent media reports may have caused confusion amongst women who have - or are considering getting - breast implants for augmentation or reconstruction. This post clarifies what we know about BIA-ALCL. The breast implants Dr Sharp primarily uses are of extremely high quality, and carry the lowest possible risk of ALCL forming. For more information about breast augmentation, breast implant science and safety, visit a RACS qualified plastic surgeon who is an ASPS member - and #doyourhomework before having any cosmetic surgery procedure. Ask us your breast implant questions!